Youngstown State University’s swimming and diving team starts its season after a recording-breaking 2015-16 season. The team broke eight records (a school record) in one calendar year. The team will be looking to build off such a strong season by getting better. Despite the solid performances, Oakland University grabbed the Horizon League title. YSU opens its season at the Tom Stubbs Relays on Friday. Head coach Matt Anderson said the team “had a really good year last year” but wants to see if the team could make the next step this season. Juniors Madison Aranda and Viktoria Orosz led the way in getting most of those school records. Aranda talked about the upcoming season and the way they can build upon eight school records and go for even more. Orosz also talked about additions to their training and everyday routines to make the team better. Anderson talked about the returning players and how they will mesh with the group of incoming freshmen. 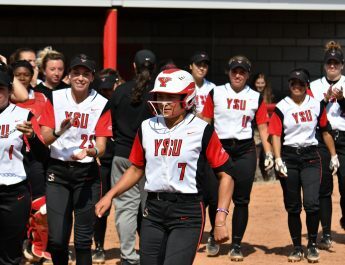 YSU added six freshmen to this year’s roster. Orosz talked about the upcoming freshmen class and how their competition will push the rest of the team. Aranda talked about the mentoring opportunities that come with a strong freshmen class. Anderson spoke about both of the swimmers, along with the other upperclassmen about their leadership and how that will pertain to winning more.